Watt’s depiction of white pleated fabric, however, is not rendered stagnantly, bereft of any sign of life. Similar to her series Shift where fabrics suggest a recently present human body, here too we get a sense of movement. The cloth hangs perhaps on the verge of revealing something behind it. Watt says of her fabric paintings, ‘Although the body is not explicitly represented, it’s still echoed in the landscape of the cloth. The paintings are about an absent presence.’ Still gives us an intimation of something or someone beyond what our eyes behold. Alison Watt: Still, 2004, 365 x 365 cm, oil on canvas. Memorial Chapel of Old St. Paul’s, Edinburgh, Scotland. Alison Watt OBE (b. 1965) is a Scottish painter best known for her depictions of drapery. She is the youngest artist to have had a solo exhibition at the Scottish National Gallery of Modern Art (2000) and to serve as an Associate Artist at the National Gallery, London (2006-8). 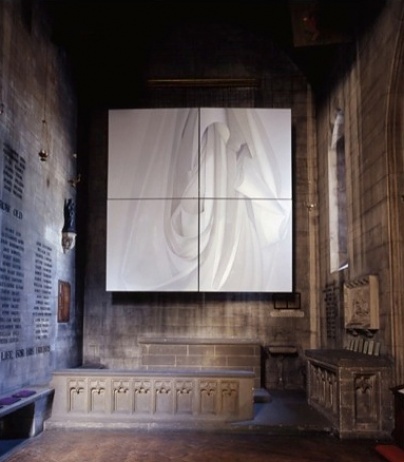 For Still, Watt won the ACE (Art and Christianity Enquiry) award for a Commissioned Artwork in Ecclesiastical Space in 2005. Kevin Burns is currently studying for his Masters in the Institute for Theology, Imagination, and the Arts at the University of St. Andrews in St. Andrews, Scotland.